← I say, São Jorge! A tourist flyer describes the city of Angra do Heroismo on the Azores island of Terceira as “The First City in the New World”. As the Azores lie on a route between Europe and the Americas, over the centuries sailing ships from Malacca, Cartagena, Puerto Rico, or Havana would stop at Angra on their way to Lisbon, Cadiz or Seville. However, with gold, silver, and other treasures from the Americas passing through, it wasn’t long before strong forts were built to defend this strategic commercial port. Overlooking the city is the 400 year old Castle of São Filipe/São João Baptista do Monte Brasil. Apparently this is the largest fort built by Spain around 1590. For us, the Azores are our first taste of Europe. The Azores archipelago are an autonomous region of Portugal so the clock has begun for our stay in the EU. Or rather, Blue Heeler has 18 months before it has to leave the EU. To get another 18 months we need to sail the boat out of the EU and check into a non-EU country. After that we can return to the EU and get another 18 months. Fortunately we also hold dual passports (Aussie/UK) so we can stay in the EU without effect from the rules of the Schengen Agreement. But what the Brexit will mean for us and Blue Heeler is anyone’s guess. In 1983, Angra do Heroismo was classified as a World Heritage site by UNESCO. Much of the old city is well preserved and is one of the most picturesque places I’ve ever visited. As luck would have it, we managed to arrive during the eleven day festival of São João. 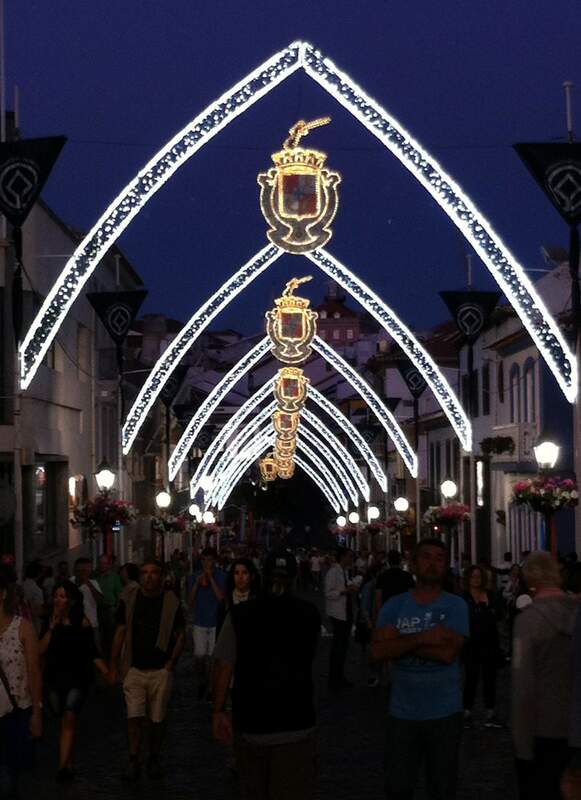 Every evening the streets are blocked and street-lights switched on while a variety of events takes place. Artisans, drummers, dancers and singing groups fill the streets, while onlookers, like us, enjoy the harmony and cheer. The Praça (square) and Town Hall fills with people eating and drinking, while various orchestras play tunes or marching drummers beat their drums. Underneath the Misericôrdia Church which overlooks the marina, plates of tapas stacked with presunto, chorizo, local cheese and fresh bread are easily washed down with large plastic cups brimming with Super Bock beer. Monte Brasil overlooking the city has a good walking trail which takes around three hours. At this time of year hydrangeas, azaleas, lantana, lilies and bougainvillea display colourful flowers along the trail. Eucalyptus trees and familiar bushes give off a familiar spicy scent, that I almost felt like we were walking somewhere in Australia. 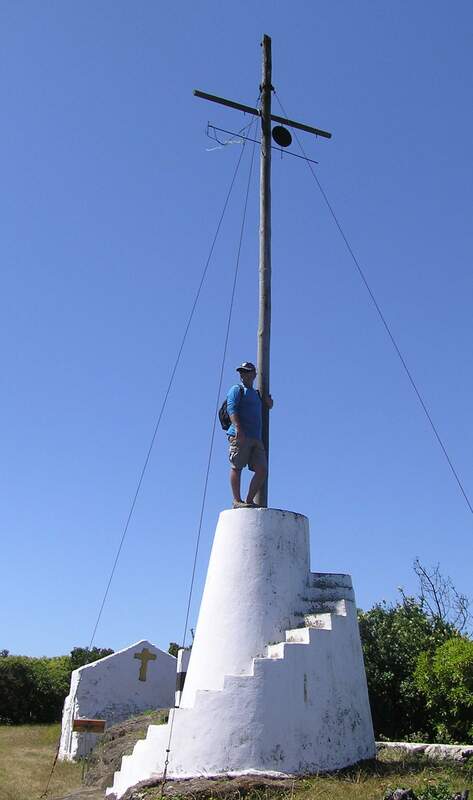 At the top of Monte Brasil is the Signal Station (semaphore) which was used during the sailing era. Monte Brasil is actually a large caldeira and the trail will take you down inside the caldeira and around the rim. Bull fighting is popular here too. 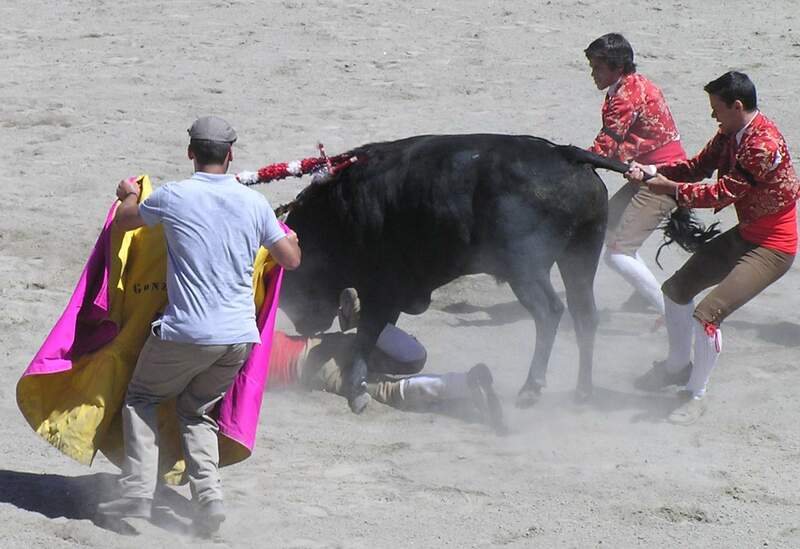 Now, I have always baulked at anything to do with cruelty to animals, however, one particular day there was a demonstration bull fight, intended for children and old people. 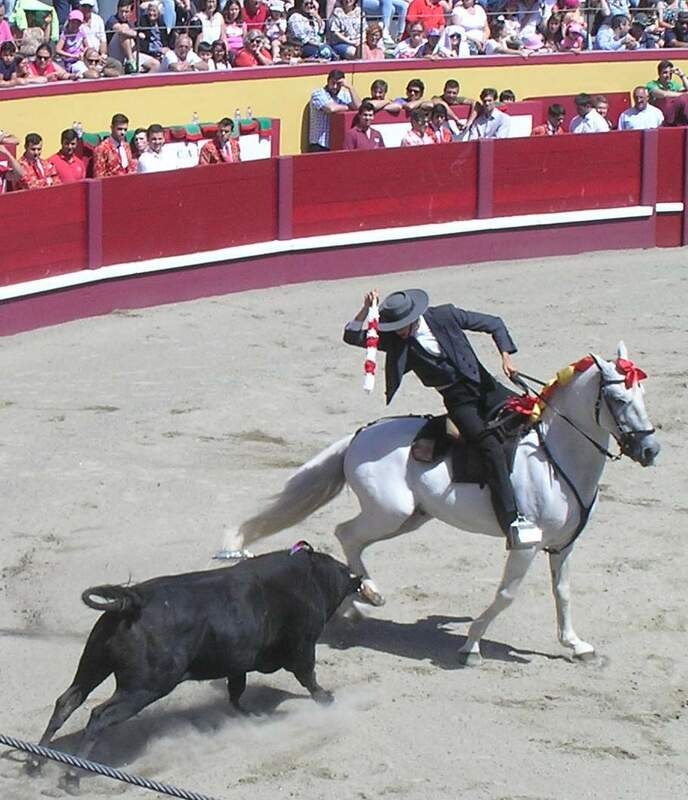 Having never attended a bull-fight (nor never wanted to), my curiosity got the better of me. As I fit one of the aforementioned categories, off I trundled to the Praça de Toiros da Ilha Terceira (Bull ring of Terceira) which is only a ten minute walk from the marina. Entry to the event was free and the crowd consisted mainly of groups of school kids, grandparents and mothers, mainly local people, and not many obvious tourists. With my wide-brimmed hat on, I sat behind an old woman who held a piece of paper over her young grandson’s head to keep the sun off his face. It surprised me to see few people wearing hats here in this open-air venue. 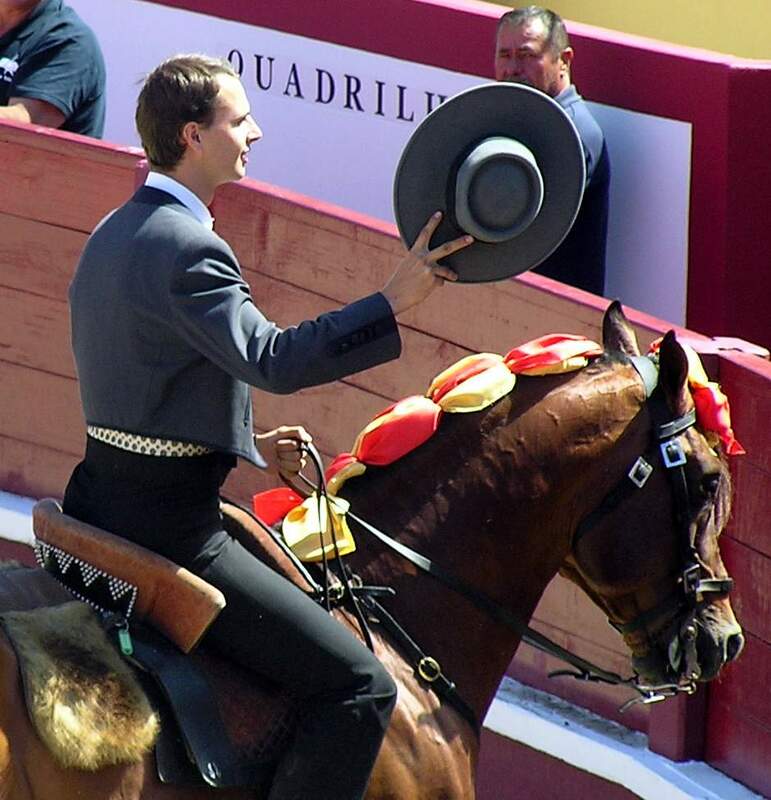 Before long the picador (guy on a horse) with tight ‘Harry-high-pants’ cantered in on his fine steed. Minutes later a perky black bull with clipped horns appeared from the darkness. I was previously told that as the audience would be children and old folk, no bull would be slaughtered during the day’s event. At least not in front of the kiddies! “Trampled Underfoot” cue Led Zeppelin! While I sat there feeling somewhat hypocritical (animal lover / blatant cruelty) the audience clapped and cheered whenever a sharp spear (pica) with sparkly tinsel was stabbed into the bull’s neck. I couldn’t quite understand their enthusiasm. 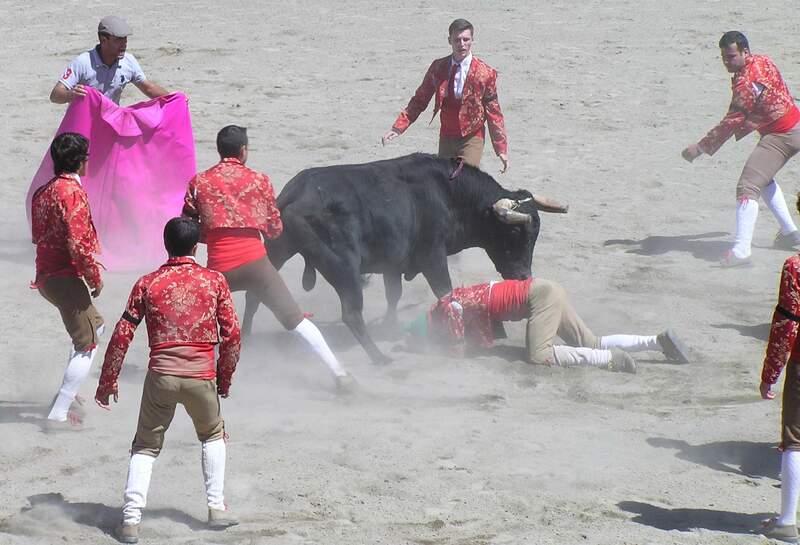 Only when the bull managed to hook one of the guys with his horns then trample on him did I secretly cheer the bull! After a while though, I’d had enough of bull tormenting. This wasn’t for me. The bull, who had also had his fair share of bull tormenting, was led back into the darkness to an undisclosed fate. I’m surprised such an event still exists nowadays with many groups condemning this barbarity. Later that night we were invited out to dinner to help Rob celebrate his birthday. It was a great night and, er, we all had steak for dinner! 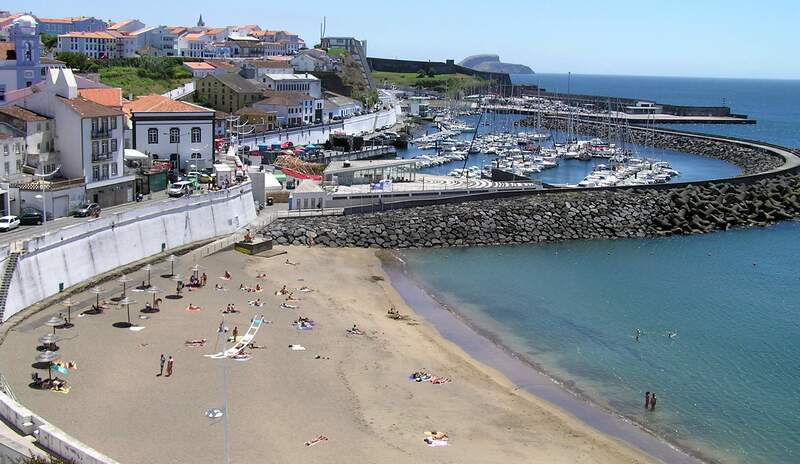 Also during the months between May and September, Terceira is also well-known for the ‘running of the bulls’ which takes place in many of the towns around the island. We didn’t participate in this crazy activity, but videos of past events were displayed on walls and TV screens around the city. Maybe during this event the bulls have a chance to get their own back at the tormenting men. Here’s a taste from Youtube. So that’s all I’m going to tell you about the Azores. If you want to know more you should come and discover this amazing place! And now it’s time to leave. 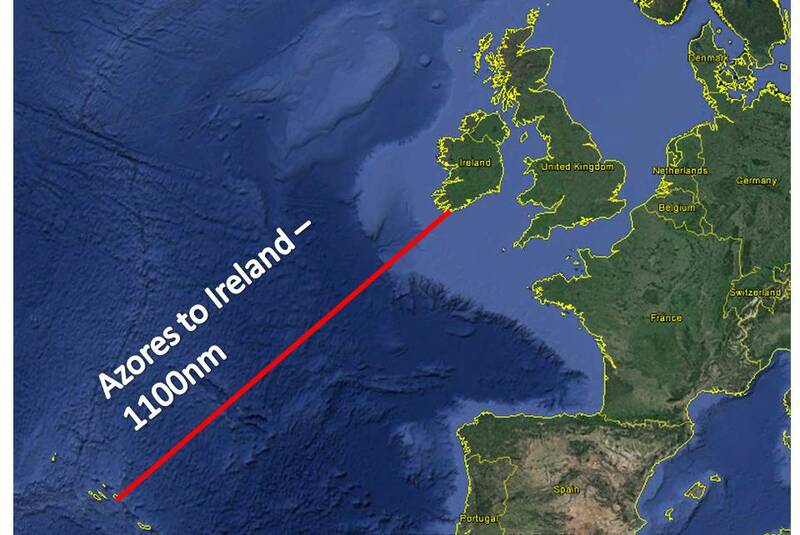 Saturday we plan to depart Terceira and head directly for Ireland. 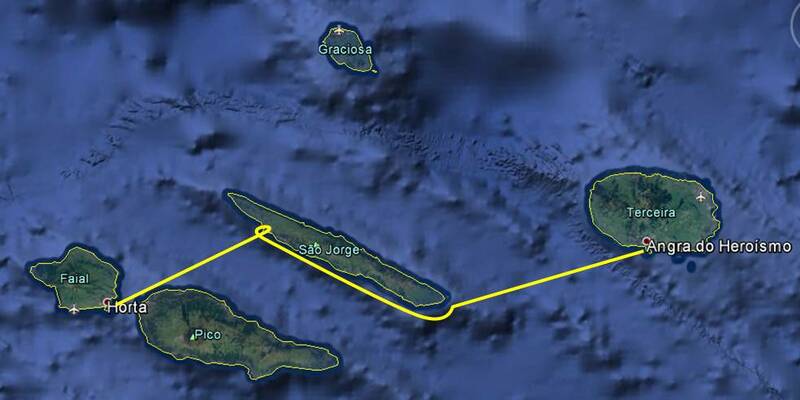 The distance is around 1100nm and it should take us between 7-10 days. The forecast weather to the north has improved and the lows don’t seem so threatening as they were a few weeks ago. Already many boats have left for either Portugal, Gibraltar, France or the UK, but the marina at Angra is still very full as you can see in the image above. Tonight the crews of Inish and Inishnee will join us for farewell drinks and tapas aboard Blue Heeler so we plan on enjoying what little time we have left in the Azores with friends. Aside | This entry was posted in 2017, Azores, North Atlantic. Bookmark the permalink. What an amazing journey you guys are having! Was about to say holiday but it’s a permanent adventure 👍 I was in Ireland last year, enjoyed the Craic there 😀🍻 look forward to the updates.